Periyar Wildlife Sanctuary is one of the largest and most visited wildlife reserves in India, and one of Kerala’s most popular destinations. It’s located in the Cardamom Hills section of the Western Ghats at an altitude of 900m-1800m. Temperatures are cooler than on the coast, ranging from 15 – 30 degrees celsius, so bring warm and waterproof clothes. Although you are extremely unlikely to see tigers, there’s a good chance of coming across elephants, sambar, gaur, mongoose, wild boar and plenty of birds. The best time to visit is the dry season from December to April when animals are drawn to drink at the lakeside. Kumily is the nearest village to Periyar Wildlife Sanctuary and is the main base. It’s located a few kilometres north of the sanctuary. 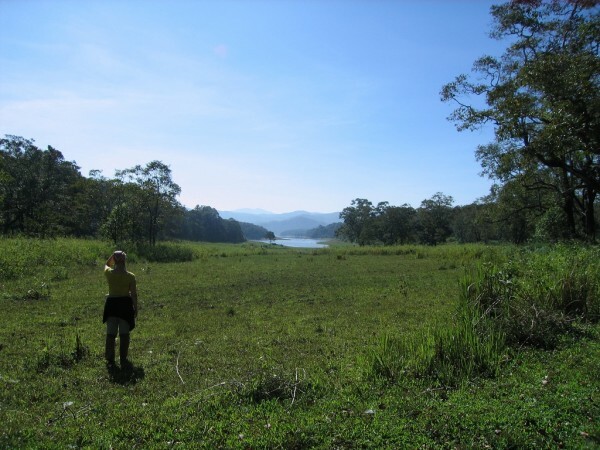 Thekkady is the name used for either the entire area or the park entrance. Kumily is a tourist town and every hotel can arrange tours, as can the many tour agents in town. The main tourist area of Periyar is the lake which is surrounded by forest. Tours outside the park – You can arrange tours of spice plantations, tea factories and Elephant Junction for elephant rides. Boat Ride – The most common way of visiting the park is on the KTDC boat trips on the lake. These can get crowded and the engine noise prevents you seeing much wildlife. The best chance of seeing wildlife is on the 7am trip. Trek – A range of treks are available with local tribal guides from 3 hours to 3 days. The forest department organises these tours and they need to be booked though the Eco Tourism Centre on Ambadi Junction. Bamboo Rafting – This alternative boat trip is also bookable at the Eco Tourism Centre and has a much better chance of seeing wildlife as the rafts are paddled rather than motor-driven. They hold 4-5 people and some walking is also included. Jeep Safari – All hotels and agents can book half or full day jeep safaris into the jungle bordering the park (the park itself is protected). Most people stay in Kumily as there is only limited accommodation in the park itself, and it is more expensive. I recommend staying on the edge of town where it’s quieter and you have views into the forest, but are still in walking distance of the shops and restaurants. Budget: Meadow View Inn has great views into the forest from its simple stilted huts. It’s located on the edge of town near Coffee Inn, a popular guest house on Thekkady Rd. The Jungle Cafe next door has tasty food including dosa and uttappam for breakfast. Midrange: Pepper County Homestay is a friendly homestay just outside of Kumily amongst spice plantations. Luxury: Cardamom Club has seven large deluxe rooms in a quiet location five minutes drive from Kumily on the way to the Sanctuary with views overlooking the forest. Kumily can be reached by bus or car from Kochi (6 hours), Kottayam (4 hours) and Munnar (4 hours). If you are coming from Alleppey you can change buses in Kottayam. These times are for buses, but you should always allow extra time as there can be delays on the winding mountain roads. The views on the way are beautiful though. If you hire a car and driver the journey time can be reduced, and you can stop to take photos along the way. You can also reach Kumily by bus from Madurai (5.5 hours) in Tamil Nadu. All buses arrive in Kumily from where you can take a rickshaw to the park entrance. Periyar Wildlife Sanctuary is a popular tourist destination so in my next post I’ll be continuing with the Quiet Alternatives series with some off the beaten track alternatives for wildlife viewing. This entry was posted on Sunday, February 28th, 2010 at 3:00 pm	and is filed under Kerala India Travel, Periyar Wildlife Sanctuary. You can follow any responses to this entry through the RSS 2.0 feed. Both comments and pings are currently closed.